A French classic. Sweet brioche enriched with egg and butter for softness. 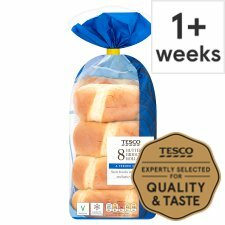 Traditionally made by a French family run bakery, our brioche rolls are enriched with butter and eggs for a soft and golden finish. INGREDIENTS: Wheat Flour, Sugar, Pasteurised Egg, Water, Concentrated Butter (Milk) (5%), Rapeseed Oil, Emulsifier (Mono- and Di-Glycerides of Fatty Acids), Yeast, Dried Skimmed Milk, Salt, Wheat Gluten, Hydrolysed Wheat Protein, Thickener (Carboxymethylcellulose), Flavouring, Milk Proteins, Colour (Beta-Carotene), Antioxidant (Ascorbic Acid).